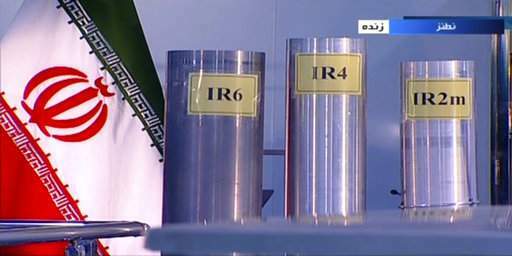 On June 6, 2018, three versions of domestically-built centrifuges (identified as IR-2M, IR-4, and IR-6) are shown in a live TV program broadcasted by the Islamic Republic Iran Broadcasting (IRIB), state-run TV, from Natanz, an Iranian uranium enrichment plant. Natanz, about 155 miles south of the capital, Tehran, includes underground facilities protected by more than 25 feet of concrete, which offers protection from airstrikes. The broadcast made a point to show the centrifuges labeled in "English alphanumeric texts" in the background. The devices, which are shown are more-sophisticated and currently prohibited from being manufactured under the Iranian nuclear agreement a.k.a Joint Comprehensive Plan of Action (JCPoA) with world powers. Earlier on May 8, 2018, President Donald Trump finally withdrew the United States from the JCPoA, a most anticipated deal signed in Vienna on July 14, 2015, between Iran, the P5+1 (the five permanent members of the United Nations Security Council — China, France, Russia, United Kingdom, United States—plus Germany), and the European Union. The deal stipulated the gradual lifting of the anti-Iranian sanctions in exchange for Tehran maintaining the peaceful nature of its nuclear program. Remaining signatories have said they remain committed to the deal so long as Iran is honoring the agreement. Later on May 19, Ali Akbar Salehi, the head of Iran's Atomic Energy Organization said Iran had several options, including resuming its 20 percent uranium enrichment if the European countries failed to keep the pact alive. Despite the initial assurance given by European signatories, Iran asked them to present a credible compensation package by the end of the month (May 2018) to make up for the loss of income to Iran caused by the U.S. sanctions. On May 23, Iran’s supreme leader, Ayatollah Khamenei said his country would stay in the deal on three strict conditions. Condition 1: EU had to protect Iranian oil sales from US sanctions and continued to buy Iranian oil. Condition 2: European banks safeguard trade with Iran, including by keeping the country inside the Swift international payments system. Condition 3: France, Germany and the UK not to seek a new agreement on Iran’s ballistic missile programme, or its regional activities, including its presence in Yemen, Iraq, and Syria. (Broadly, Russia and China agree to these terms). On June 5, Iran informed the U.N. nuclear watchdog that it would increase its nuclear enrichment capacity yet stay within the provisions of the deal. According to JCPoA agreement, Iran can possess no more than 660 pounds of low-level enriched uranium (sufficient to fuel a civilian reactor). That’ compares with the 220,460 pounds of higher-enriched uranium it once had. "After the supreme leader's order, we prepared this center within 48 hours. We hope the facility to be completed in a month," Salehi said on June 6 in the same broadcast. Salehi also said mass production for new-generation centrifuges will take years to be fully operational. — "Every new generation of centrifuges needs eight to 10 years for testing,"
Pompeo's gave the following statement after IRIB broadcast. "We’re watching reports that Iran plans to increase its enrichment capacity," Mike Pompeo, the United States Secretary of State wrote in a Twitter post on Wednesday. "We won’t allow Iran to develop a nuclear weapon. Iran is aware of our resolve." At a press conference with visiting Israeli Prime Minister Benjamin Netanyahu in Paris late on June 5, the French leader called on "everyone to stabilize the situation and not give into this escalation, which would lead to only one thing: conflict." "It simply shows that when you decide to unilaterally end an accord it does not encourage the other party to respect it," the French leader said in a blunt rebuke to U.S. President Donald Trump and his decision to withdraw from the deal. Netanyahu, who originally traveled to Europe this week to defend the U.S. decision, told the news conference that he did not attempt to convince Macron to follow the U.S. example and abandon the deal because he believes it will die from its own weight. Netanyahu was apparently referring to decisions by Total, Allianz, LUKoil, PSA, Siemens Reliance Industries, and other global businesses in the last month to reconsider doing business with Iran because of the looming threat from the United States in the form of "punitive measures" against them if they continue dealing with Iran once American sanctions are back. It is very much crystal clear, a return to pre-JCPOA sanctions spells a nightmare for the current Iranian regime, specifically due to the status quo of Iran's turbulent domestic atmosphere which includes regular protests, strikes, and demonstrations. And at the same time, the current emerging consensus in the middle east could also lead to "war".